The market is great, but maybe not as great as you hope. This summer was a strange one; strange in that it was more normal. Over the last two years, the market plowed right through summer, overbids, multiple offers and all. This year we still had good market activity, but it slowed down-offer dates came and went, in some cases without offers. My observation is that buyers are tired and sellers are wanting to hit the market at the height. Call me conservative; I suggest cautious optimism in the sale of your home. • At the end of the third quarter 2014, 13 homes had sold. Of the 13, 11 of them sold for more than asking, 10 of them with multiple offers. Compare that to the second quarter where 11 had sold; nine of them received multiple offers and all 11 sold over asking price. This highlights the importance of pricing. Both of the homes that sold below asking in the third quarter had started too high, not letting the market determine price. • Of the 13, 38% of them reportedly sold for all cash, compared to 10% in the second quarter. If we look to the first quarter, 30% of the sales were reported as all cash. I am dragging the first quarter back into the comparison to shed some light on what may have happened in the second quarter. Did we see a lull? Buyers felt more emboldened to get financing, than to pay all cash; in the third quarter cash was back. • The amount of the overbids in the second quarter ranged from a low of $51,000 to a high of $467,000 over asking (which in that case was nearly 28% over the asking price). Note that this home sold for 37% percent over its 2007 sale price. I should further note that the high was the exception, not the rule. • At the end of the third quarter, all properties that were on the market sold, as opposed to the second quarter, where there were two properties that had not sold. Both had been tenant occupied and one of them was in the foreclosure process. This is significant in that even the overpriced properties sold, so there were outside influences in those two properties that made them less desirable, or salable. Note to sellers, get rid of those problems before you go on the market. • I have seen several instances where sellers have a higher expectation for the value of their home than the market will bear. It’s an expensive lesson for a seller; those homes usually sell for less than they would have if priced correctly to start with. • As for property values quarter to quarter, it looks like West Portal proper and Inner Parkside, have seen a 2-4% increase in values. This smaller increase could be a result of less on the market and fewer buyers in the market in the Summer. • The area I call North of Ulloa (NoLoa), which is Inner Parkside North of Ulloa St., is where the majority of sales in the neighborhood occur. I figure we have seen as much as a 15% increase between the last two quarters. My theory is that market pressure is to thank. 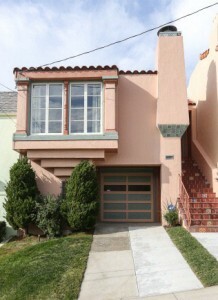 Prices in West Portal and Inner Parkside have priced many people out. Even the Sunset is seeing sales of a million dollars or more, so the market is squeezing NoLoa up in value. I expect that rate of appreciation will slow down and fall in line with West Portal and Inner Parkside. • The marketplace is not seeing every property selling at the same level of frenzy as it once was. The best answer remains for sellers to do everything they can to minimize their homes quirks, get rid of problems if possible and price the home for the market, not for their desired outcome. Eric Castongia, CRS, BRE No. 01188380, Residential Sales Specialist at Zephyr Real Estate provided the information in this article. The content of this article is an interpretation of data from the San Francisco Multiple Listing Service and Eric’s observations in the marketplace. Eric can be reached by e-mail at Eric@SFHotBuy.com, or via mobile phone at (415)307-1700.